Crown Landscaping & Pest Control can help with your commercial and residential pest control problems. Below are some examples are some examples of pests you may need help with. The pavement ant is representative of a broad group of ground nesting ants that are found throughout the northern and eastern parts of the United States. Pavement ants live in colonies with a social structure. Homes and buildings with slab-on ground type construction are particularly prone in invasion by pavement ants. Bed bugs are small wingless insects that feed solely upon the blood of warm-blooded animals. They are a parasite that have existed since ancient times. There are at least 92 known species of bed bugs found throughout the world. The most common species is the Cimex lectularius , which is best adapted to human environments. The body of the female house spider is about 3/16-to 5/16-inch long and yellow-brown with a dirty-white abdomen with “army sergeant” stripes on the back. Males are much smaller that the females. House spiders lay their eggs in brownish silken sacs which have a tough papery cover. Scorpions are a distinctive and well recognized group of arachnids. They are most easily distinguished by their lobster like appearance gut especially by their fleshy “tail” that terminates in a bulbous sack and prominent stinger. The larger from pincers (modified mouth parts are used to capture and hold prey while feeding. The stinger is used to subdue prey and for defense. Honey bees have three castes in their colonies: workers, queens, and drones. 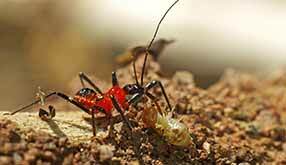 Workers are 1/2 to 5/8 inch long and have well-developed heads with two short antennae and large eyes. Because they are covered with fine hairs, they have a fuzzy yellow-brown to black appearance. The abdomen has a striped appearance. There are two pairs of wings, the hind pair shorter that the front. Workers have a barbed stinger at the end of their abdomen that is used against anything that threatens the colony. Yellow jackets (wasps) are marked with bright yellow and black pattern. They appear to be hairless and are about 3/8 to 5/8 inch long. The bald-faced hornet is similar in appearance except that it is black and white and 5/8 to 3/4 inch long. The males and queens are produced in the colony in late summer. They mate, and the fertilized queen overwinters in a protected site. In the spring she seeks an appropriate nesting site in which she builds a paper nest using chewed up wood fibers. The uric acid in the pigeon’s feces is highly corrosive and a flock of pigeons can cut a roof life in half. They frequently cause extensive damage to air conditioning units and other rooftop machinery. There are also other economic costs associated with pigeon infestations such as slip and fall liability and projection of unclean, dirty company image. The Norway Rat is the largest of the commensal (living in close association with humans) rodents. The head and body are 7 to 10 inches long and the tail is an additional 6 to 8 inches. It has a stocky body and it weighs 7 to 18 ounces. The fur is coarse, shaggy and brown with some black hairs. The muzzle is blunt, eyes and ears are small and the tail which is bi-colored is shorter that the head and body combined. Jerusalem crickets are potentially huge insects that feed on vegetables and root crops, but primarily are predatory on other insects. Females are even known to kill and eat a male following copulation. They have huge, strong jaws which they use for digging, allowing them to burrow under rocks or bury themselves in holes in the soil.